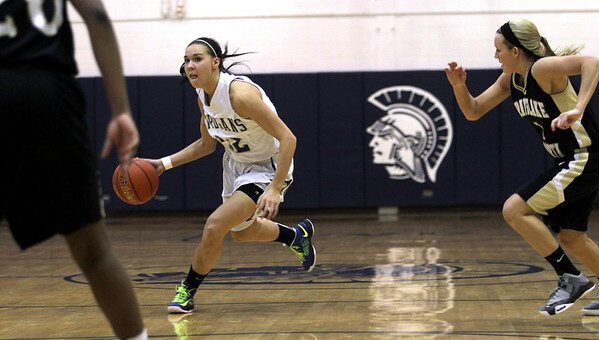 Monica Maschak - mmaschak@shawmedia.com Joslyn Nicholson eyes her defenders in the final quarter of the Fox Valley Conference crossover game against Grayslake North at Cary-Grove High School on Friday, February 8, 2013. The Trojans won 56-48. Monica Maschak - mmaschak@shawmedia.com Team Captain Katie Barker, surrounded by Grayslake North guards, fights for control of the ball in the last quarter of the Fox Valley Conference crossover game at Cary-Grove High School on Friday, February 8, 2013. The Trojans won 56-48. 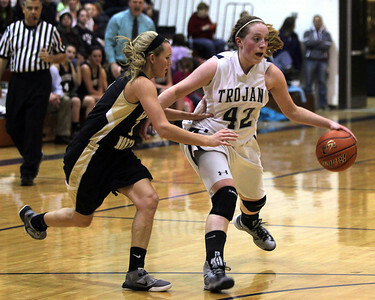 Monica Maschak - mmaschak@shawmedia.com Olivia Jakubicek (42) moves down the court in the Fox Valley Conference crossover game against Grayslake North at Cary-Grove High School on Friday, February 8, 2013. The Trojans won 56-48. Monica Maschak - mmaschak@shawmedia.com Grayslake North's Joanna Guhl jumps for a score attempt in the third quarter of the Fox Valley Conference crossover game at Cary-Grove High School on Friday, February 8, 2013. 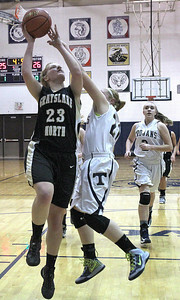 Grayslake North lost to Cary-Grove 56-48. 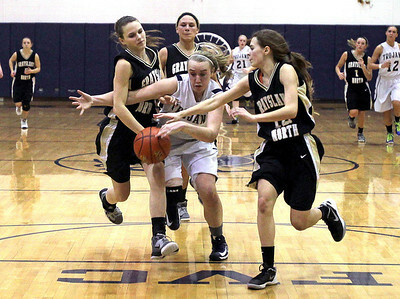 Team Captain Katie Barker, surrounded by Grayslake North guards, fights for control of the ball in the last quarter of the Fox Valley Conference crossover game at Cary-Grove High School on Friday, February 8, 2013. The Trojans won 56-48.